Cost Segregation | CENTERGY TAX, INC. It is critical that you use professionals with the requisite knowledge of tax law and IRS guidelines. Cost Segregation is a widely accepted tax planning strategy used by commercial real estate owners and tenants alike to accelerate depreciation deductions, defer tax, and improve cash flow. You have a valuable opportunity to lower your income taxes if you built, purchased or renovated real estate in a prior year, but have not engaged in a cost segregation study. The IRS gift horse allows you to retroactively deduct depreciation amounts that you are legally entitled to, but may not have not take advantage of due to erroneous property classifications. not perform the study in the first year, you are able to utilize the unclaimed depreciation without amending prior years returns. When you invest in a cost segregation study, you are able to reclassify or segregate real estate components into real and personal property. Depreciation periods can be reclassified and accelerated from 39 or 27.5 years to 5,7,or 15 year property. Without the study, legally your CPA may only use straight line depreciation. This can result in savings of up to to.22 cents or more on every dollar. The table below is an illustration of a newly constructed assisted living facility with a total building cost of $118,297,204. 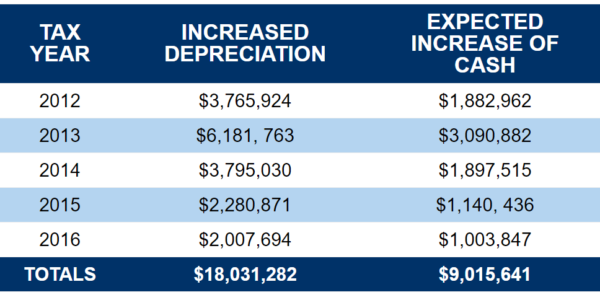 To illustrate the benefit of the Cost Segregation Findings, the table displays the increased depreciation, which depicts potential increased cash flow. Please note that each taxpayers benefit will vary based on their specific tax scenario. Many entities perform cost segregation studies, but it is imperative that you select a professional with extensive knowledge of the tax laws and code. By investing in a properly prepared cost segregation study you will have the assurance and peace of mind that you have maximized your depreciation benefits and have fully documented support for your claims. Centergy has offices in Northern & Southern California. We have a team of appraisers, retired assesors, CPAs, attorneys, real estate brokers, cost segregation and finance professionals that will handle the process from start to finish. Most fees are contingency based, so if we don’t prevail, you don’t pay.